Author(s) Ornstein, Allan, C.; Hunkins, Francis, P.
Geared for graduate and doctoral level students specializing in curriculum supervision and administration and educational leadership. May also be appropriate for some upper level undergraduate and graduate level introductory education courses. A comprehensive, thoroughly documented, balanced overview of the foundations, principles, and issues of curriculum–from leaders in the field. 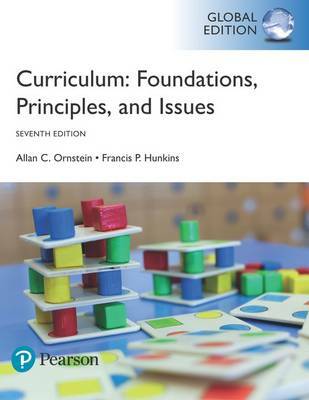 This balanced, comprehensive view of the entire field of curriculum encourages readers to consider choices and formulate their own views on curriculum foundations, principles, and issues. Rather than focusing on either theory or practice, or advancing a particular political or social position, or approaching the field of curriculum as an administrative challenge, this book gives readers the information they need to develop their own opinions on curriculum today as well as their outlooks for the future. Curriculum: Foundations, Principles, and Issues covers the latest topics in education that impact the curriculum and features Learning Outcomes, Discussion Questions, and Curriculum Tips to enhance understanding of the material.